Justin's WeatherTalk: Our Very Own Snow. For Real! I am postponing the Snowfall Records until tomorrow so I can spend my limited weekend time on tonight's snow. My former radio partner Tony Pann tried convincing me on Friday- but I did not buy it. If you see the TV Graphics page, my outlook map for Sunday (from Friday) showed a chance of rain late... I thought there was a chance that this might even miss us to the south. The snow I had on the map, was back in the mountains. But things change. 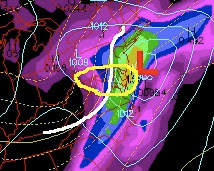 Here is the proven NAM model showing the '540' line by this evening. 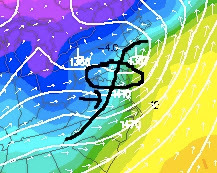 There will be enough moisture as the freezing line catches up to drop some snow. Another shot appears to want to move in New Year's Day. 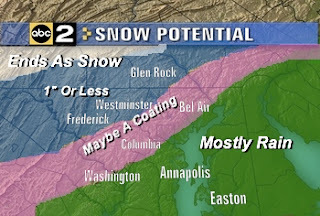 That was my original forecast early last week, and I was talked out of it by Thursday. Well, it's back. As of this morning, there did not seem to be much grid model support for local snow. This was due to temps being too warm, and the precip departing before was have a chance. However, I do believe we will get cloud temps to cool down enough, but with wet ground and marginal surface temps, here is what I expect locally. If you are local then I will be back on ABC2 Monday morning with the latest. It is a sign of the pattern turning more favorable for us in January. Although it make take until the 2nd week of the month for us to truly make to turn to colder weather for a longer duration.